Flying head-on into night, the last sliver of daylight illuminates the eastern sky as the terminator slips toward us from beyond. We are in the midst of an abstract dream as it is both night and day. 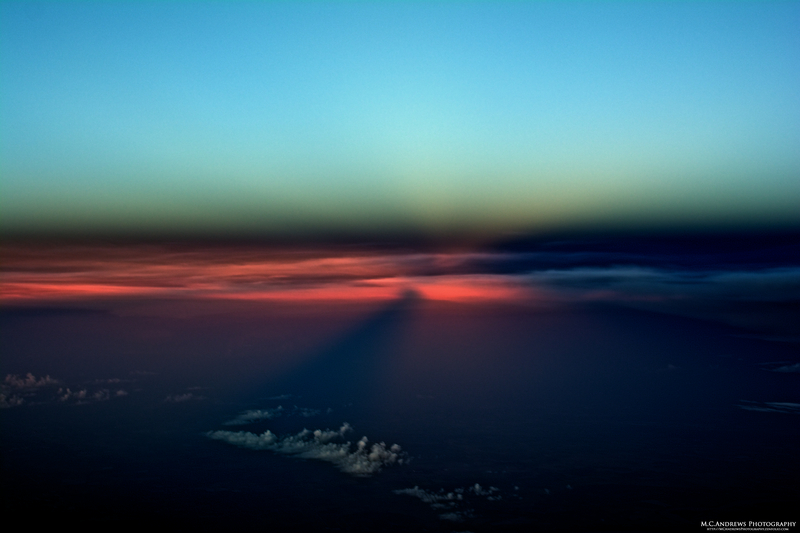 The darkness emerging from the aerial horizon is more distinct and defined than the fading light being consumed by the shadow. From behind us, the low sun casts the shadow of our jet on the horizon directly in front of us and the light scatters back at us in radiant shadowy rays as if some dark sun were peaking out of the twilight. This fleeting view into the twilight zone lasts for a long moment before being consumed by the darkness and leaving us to reflect on our wakeful dream.